The words “Keep your eye on the grand old flag” by George M. Cohan comes from Cohan’s song, “It’s a Grand Old Flag,” a stage musical he wrote over 100 years ago. It was 1906 to be exact. The song is second in popularity only to the National Anthem, particularly with children. The stars and stripes flag is an icon of our democracy and the message is important to all who believe in freedom and bravery. On Tuesday, July 4th , there will be plenty of flags waving on the Plaza because the Sophienburg Museum and Archives is once again holding a July 4th Celebration on that day. A large crowd is expected, so get to the Plaza to find a place to watch the parade that starts at 9:15 am. You will also be entertained by the Community Band and a fly-over is expected. Now, please allow me to repeat a July 4th article that first appeared in the Herald-Zeitung in 1907. There were four triumphal arches downtown close to the plaza and a giant picture of George Washington displayed at the Zeitung printing shop. The spot chosen for the festive events was in Comaltown where Eagles Hall is now located. A dance platform had been constructed as well as tables and chairs shaded by the beautiful graceful oak trees. On the eve of the celebration, a cannon on Sophienburg Hill was fired 13 times in commemoration of the 13 original colonies. At the break of day on the 4th, people were awakened by the rapid firing of the cannon, followed by trumpets heralding the beginning of the festivities (no sleeping in on that 4th). Soon thereafter, the Hortontown Germania Singing Society on saddled horses, and the Clear Springs Band on a decorated wagon, entered the town and were escorted up Seguin Avenue and San Antonio Street by the New Braunfels Band. And now began a history parade of unprecedented magnitude. Headed by parade marshal F.B. Hoffmann, the pageant played itself out. In Spanish costume came Columbus (Valentin Pfeuffer) and his faithful Fernando (Bruno Voelcker). Then came George Washington (Johann Merz), followed next by a company of National Militia and finally prisoners of war in red uniforms representing English soldiers. At their side marched the boy drummer, one arm bandaged and a bullet riddled drum slung over his back. Next, came the Liberty Bell float drawn by four beautiful white horses. There sat John Hancock, surrounded by John Adams, Robert Livingston, Robert Sherman, Thomas Jefferson, and Benjamin Franklin who presented the Declaration of Independence. Then came floats of early New Braunfels pioneer years; Indians crouched in bushes spying on Prince Carl and next to him guards von Coll and von Wrede. Under a tree sat a pioneer mother and her family. Four Adelsverein soldiers hired by the Prince to protect the immigrants were played by sons of four men who were actually the original soldiers. 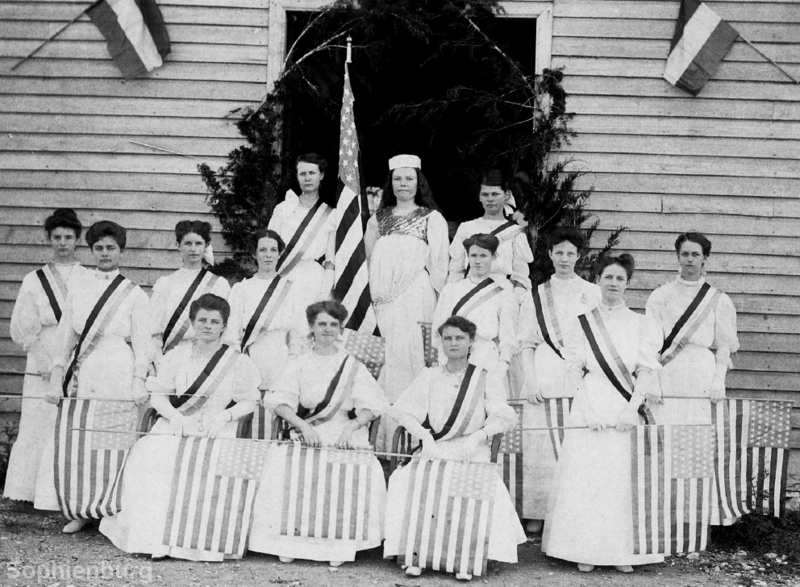 Miss Anna Rennert, as the Goddess of Liberty, was seated on a pedestal with 37 young ladies seated at her feet clad in white with blue sashes representing each US state. The next two sections in the parade were from various organizations in town, followed by business floats, two of which were particularly interesting. The New Braunfels Woolen Factory had a loom powered from a wheel on the wagon demonstrating weaving and the Zeitung had a printing press with editor Anselm Eiband printing out “Song of 1776” to be distributed later. Halting at the Plaza for photographs, the procession crossed the low water bridge and up the hill to Comaltown. After an opening speech by Hermann Seele, the festivities began and in the evening George Washington led the Grand March. Dancing on both days didn’t end until sunup. What stamina they had! On Sunday, July 2nd at 9 am, Tara Kohlenberg, Linda Dietert and Joanna Lewis will speak on the Sophienburg’s Reflection Program about the July 4th Celebration. They will fill you in on history and give you personal stories of what they remember about that date here in New Braunfels. Liberty and the 13 Colonies July 4th Celebration in 1906 at Teutonia Hall. Top row from left: Hilda Baus, Ellie Rompel and Emma Meyer. Middle row from left: Hulda Reeh, Elvira Rohde, Hilda Dietert, Elfrieda Tausch, Sophie Luersen, Meta Reeh, Stella Soechting and Olga Kraft. Seated from left: Else Simon, Erna Hoeke and Else Rose.